The atrocities committed by ISIS in Paris on Friday, November 13 were one of the worst attacks in France since World War Two. Widely seen as “France’s 9/11,” the attacks have resulted in a wave of reaction in France and across Europe. However, this is also a contradictory situation because of the opposition to war in large sections of the population and the continuing struggle against austerity. The growth of the far right can also act as a spur to the left. French president François Hollande responded to the Paris attacks by declaring a state of emergency, a grotesque crackdown on civil liberties, and ordering another, wider bombing onslaught on the ISIS-held town of Raqqa in Syria, carried out alongside the U.S. Their high-tech missiles – inflicting mass terror, death, and injury on civilians and ISIS personnel alike – will do nothing to prevent further terrorist attacks in the West. The state of emergency directly cut across what would have been mass protests in Paris during the recent climate conference. There has been a boost in support for the far-right French National Front (FN) of Marine Le Pen. In the first round of December’s regional elections, the FN got 28% of the vote, more than doubling its support since 2012 and nearly taking the leadership in three of France’s biggest regions. 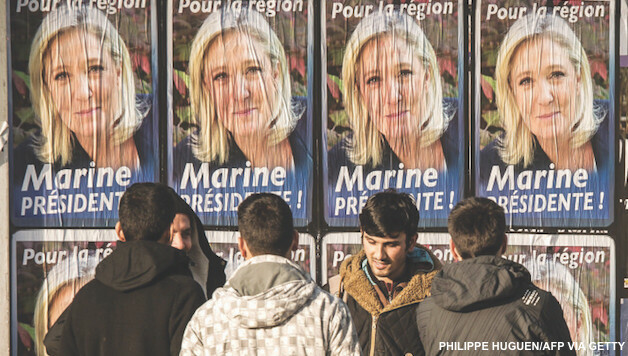 Le Pen and the FN have been riding a wave of anti-refugee hysteria. Ultimately, the FN was defeated in the second round of the elections through tactical voting by mainstream parties, even though their absolute vote increased. The impact of the Paris attacks has extended beyond France itself. There has been an increasing anti-refugee onslaught, both in terms of state policy and far-right violence. The German far-right PEGIDA has grown, calling for action to stop “the Islamization of the West.” Meanwhile, the Swedish government reversed its refugee policies, from “refugees welcome” in September to practically closing the borders altogether. The right has also made big gains in Poland. The march to war has also extended beyond France. In December, the British government voted in favor of military intervention in Syria against ISIS. This was met by the opposition of Jeremy Corbyn, the newly elected left-wing head of the Labour Party. Polls showed a majority of ordinary people in Britain oppose the bombing campaign, and thousands protested in the streets. But right-wing Labour MPs openly defied Corbyn, voting with the Tories in favor of the war. The lack of mass parties representing the interests of the working class has helped create the space for the growth of the far right, which frequently uses populist rhetoric. But the aftermath of Paris has also exposed the weakness of many of the existing forces presenting themselves as left. For example, in France itself, the Communist Party disgracefully voted for Hollande’s state of emergency and ban on demonstrations. Fortunately, the CGT, the main French trade union federation, was pressed from below to reject those attacks on civil liberties. The current political situation in Europe will not last indefinitely, and the underlying questions posed by capitalism’s crisis and endless austerity will reassert themselves. Even before the Paris attacks, the defeat of the Greek struggle against austerity due to the treachery of Tsipras, the head of Syriza, had had a negative effect on the left. But Jeremy Corbyn’s victory in the leadership of the British Labour Party in September shows that working people can be won to a genuine left position when a clear lead is given. Portugal also had a shift to the left in recent elections. It isn’t possible for the imperialist powers to completely destroy ISIS militarily. In any case, weakening it through military blows won’t stop new jihadist groups and sectarian organizations from arising – as is happening globally anyway. Nor will crackdowns on immigration and civil liberties keep ordinary Europeans safe. Defeating ISIS can only be done by the working class and rural poor in Iraq and Syria, who need to build a united, nonsectarian struggle against all the local reactionary forces – all forms of oppression – as well as those further afield. The workers’ movements in France, Europe, and elsewhere need to develop their own class-based internationalist position, completely independent of the interests and hypocrisy of the capitalist governments and ruling classes. This must include building workers’ unity and action against terrorism, xenophobia, wars, and the capitalist system itself – which, unable to meet the needs of the overwhelming majority of people, creates the breeding ground for these horrors.